If you like my site about Anguilla, please click the Facebook Like button. Enjoy best-of-the-Web pics of Anguilla. For example, this is the time of year where you cannot do the "walk-in" for Picante. It would be wise to make plans in advance and book a table and a couple of benches! Yep, the island is that hot in January. Average Rain in January: 2"
One thing that caught my eye in January, that I never saw in earlier months, were the size of the waves on Shoal Bay. This time of year they can be enormous! You may be just going for a leisurely swim, but you will be met by a wall of water that will leave you sputtering and gasping for air. But, then again, we were diving through the waves, trying to ride them to shore. We were kind of asking for trouble! He! He! In all seriousness, though, the seas can get rough in winter months. Luckily, if it's rough on one side of the island, it's calm on the other. 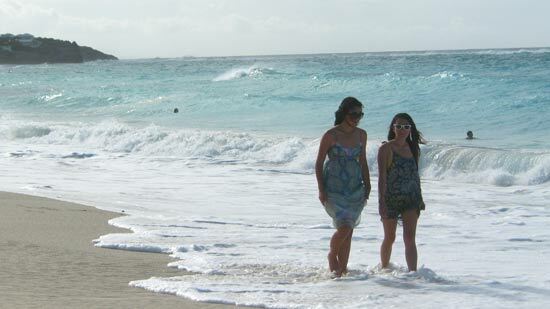 So, if the waves are high at Meads Bay, head to Rendezvous instead. And, it's very rare that Anguilla sees big waves for several days in a row. Anguilla travel tip: Similar to the weather in Anguilla in December, January is one of Anguilla's coolest months so don't forget to bring a long sleeve for nights out.